Floral Composition in Vase tapestry is an exceptionally captivating work featuring an abundance of flowers overflowing onto the table below. The petals and leaves in this composition is a work of art. The intricacy in the petals and leaves and the subtle shades of tone is masterfully executed in this piece. From the use of color with crimsons, violet blues, deep orange and olive greens in their variety of shades, to the composition of overlapping flowers with leaves protruding through, to the solitary butterfly flying by, this work is a balanced and captivating piece. Even the vase is beautifully ornate. 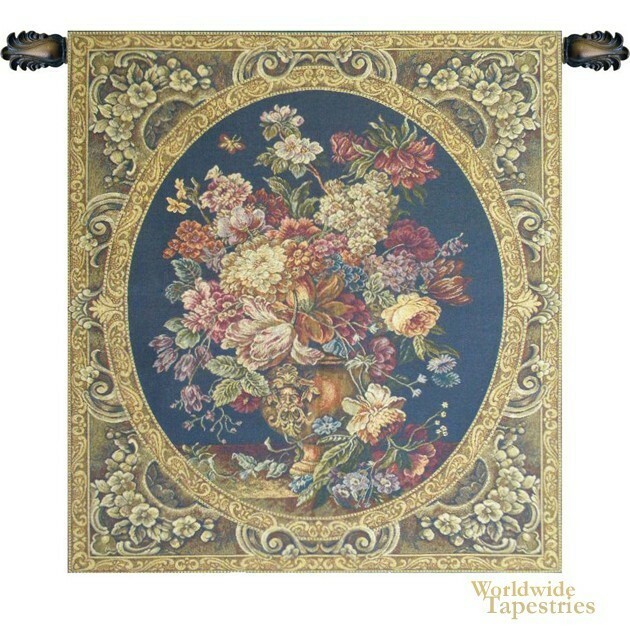 This is one of the few floral tapestries where the floral theme is able to enchant the eye to such an impressive extent. The ornate border with its scroll and floral motifs complements the floral subject. This tapestry is backed with lining and tunnel for easy hanging. Note: tapestry rod, tassels, and accessories, where pictured, are not included in the price. Dimensions: W 11" x H 14"
Dimensions: W 25" x H 30"